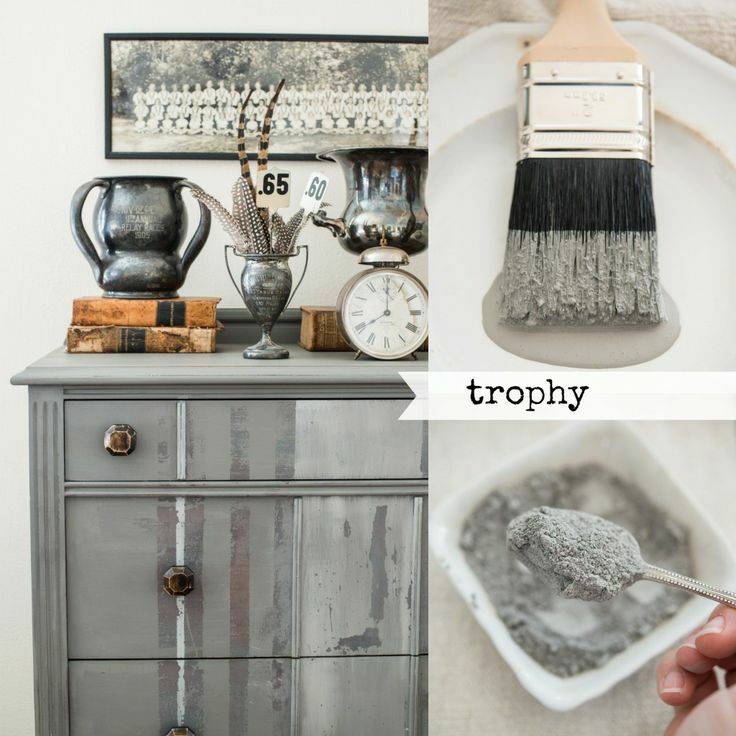 Trophy - A warm, rich gray with yellow undertones. Unlike Shutter Gray, which is very blue, Trophy is a truer gray reminiscent of tarnished silver found on antique trophies. Apron Strings - A raspberry/coral color named by one of Marian’s blog readers. She remembered her grandmother wearing a coral apron and Marian loved the story she shared and the feelings evoked by the name. When mixed with Ironstone, beautiful shades of coral can be found. Curio - A rich, walnut brown that is perfect to use as a glaze or stain. It’s also a great color to use for mixing with other colors. Pair Curio with a lightened version of Apron Strings for a classic brown and pink pairing. Boxwood - A rich, dark grassy green. Depending on the finish used on the piece, it can look bright and bold or subtle, more like a muted olive. Boxwood mixes well with Grain Sack to create a pale aqua. Layer under Lucketts Green for a two-toned, monochromatic look. Typewriter - This black in Miss Mustard Seed's line. Marian describes it as an off-black or soft black. It is named for the black color traditionally found on antique typewriters. Mix Typewriter with any of the colors in the line to make them darker and more muted. For example, when mixed with Boxwood, a deep olive green can be achieved. Mix it with Grain Sack to make a perfect charcoal gray. Shutter Gray - A French blue/gray that has a faded quality about it. 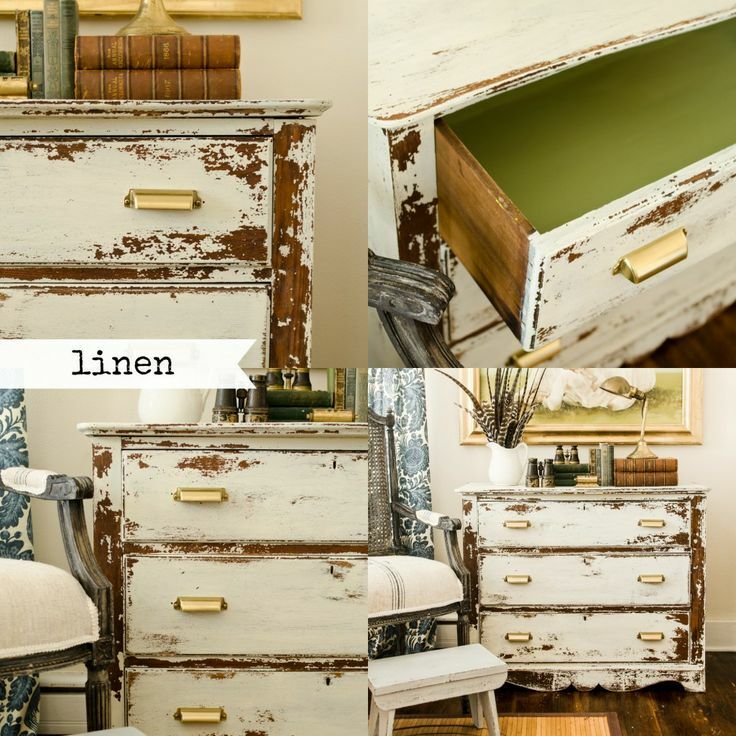 It’s named for a pair of antique gray shutters Marian found at an antique store. For a pale blue gray, mix Shutter Gray with Grain Sack. It pairs well with Mustard Seed Yellow and Linen. Dried Lavender - A soft, smoky purple with gray undertones. Marian has sold dried lavender stems in her retail spaces for years, so when adding a purple to this line that was a natural connection. Mix Dried Lavender with Linen for a pale pastel purple, and it pairs beautifully with Lucketts Green. Linen - Linen is the cream in the line. Named for linen fabrics that have slightly yellowed with age, this color has warm undertones and is a nice, creamy white. Mix Linen with colors to make the color lighter and warmer. Linen mixes and pairs beautifully with Apron Strings and Kitchen Scale. Lucketts Green - This color is named after the color of the shingled siding on The Old Lucketts Store in Lucketts, Virginia. Lucketts Green is a soft, spring green with yellow undertones. It’s very close to the color commonly found on furniture in the 1930’s and 1940’s, making it the perfect vintage green. Mix with Boxwood to make a bright, grassy green or with Linen for a pale pastel. For a nice contrast, Lucketts Green pairs well with Artissimo and Dried Lavender. Tricycle - This is the perfect red. It’s bold and bright, but still has a warm, classic look to it. Mix it with Ironstone to get varying shades of pink and with Curio to make a deeper barn red. Kitchen Scale - A rich teal, named after an antique scale Marian once owned in her kitchen. The scale has since been passed along to Jennylyn, the president of Homestead. House Paint Co. Kitchen Scale can be mixed with Linen to achieve a soft, robin’s egg blue. It pairs well with Grain Sack. Mustard Seed Yellow - A warm, buttery yellow. It’s bright without being too bold and it’s a perfect “happy yellow.” Mix it with Tricycle for varying shades of coral. It pairs well with Shutter Gray and Lucketts Green. French Enamel - This color is named for the French enamelware pitchers Marian has always admired in antique stores and magazines. The color is a vibrant, mid-tone blue. Mix it with Tricycle for a vibrant purple or Typewriter for a darker, more muted blue. It pairs well with Flow Blue and Mustard Seed Yellow. Grain Sack - This color was named for the color of antique European grain sacks. It’s a chameleon color, meaning it looks different depending on what is around it. Sometimes it looks white, sometimes gray and sometimes more beige. Grain Sack is a great color to mix in order to lighten without making the color too pastel. It pairs well with the other grays in the line – Shutter Gray and Trophy. Ironstone - This is the closest to a pure white currently in the line. This color is a slightly cooler off-white and pulls a little gray. If you want white, this is your color. Mix Ironstone with colors to lighten. Obviously, white pairs well with everything! Eulalie's Sky - A pale greenish-blue named after the color in the sky of a cow painting by artist Cindy Austin. Marian named the cow Eulalie and she has hung happily in her home for several years and has become a trademark of Marian’s style. This color pairs well with Linen and Kitchen Scale. Flow Blue - A rich blue that’s deeper than French Enamel, but not as dark as Artissimo. It’s named after the blues found on antique “flow blue” china. Marian loves Flow Blue layered under French Enamel for a two-toned finish. It pairs well with Boxwood. Artissimo - A navy/midnight blue named for the blue and white fabric Marian used in her master suite. Depending on the finish, it can look like a brighter royal blue or almost black. Artissimo pairs well with Boxwood and the other blues in our line. There are many ways to mix the milk paint, MMSMP offers guidelines on how to mix it and what consistency to look for, however we encourage to always test out a small amount to make sure that you are happy with the mixture. 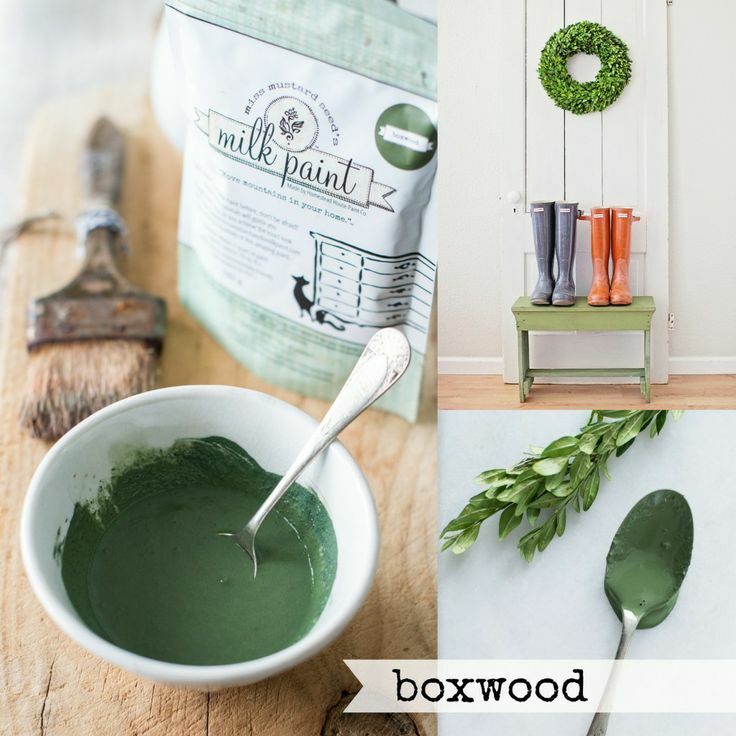 Milk Paint can be a stain or a solid opaque paint depending on how much water you add. Lumpy & Uneven Milk Paint? What’s the Difference Between Antiquing Wax & Furniture Wax? Using Hemp Oil vs. Wax?